Despite its name, I was pretty sure that this wonderful stamp set (and coordinating dies) would be very versatile and useful for so much more than Christmas cards! This card is for a friend who has two dachshunds and, I confess, that was my main prompt for purchasing the set! On a piece of Whisper White cardstock I stamped the table with Crumb Cake ink and the complete dog with Basic Black ink. I then used the reflection technique to produce the second dog (used Basic Black ink to stamp the dog onto my Stamp-a-ma-Jig sheet, turned it ink side down onto the cardstock and pressed the ink onto the card). I watercoloured this little scene using Peekaboo Peach, Soft Suede, Crumb Cake, Smoky Slate, Pool Party and Night of Navy inks and the teeniest bit of Cherry Cobbler for one of the dog collars. I used the out of the box technique to cut out the scene with the circle die, leaving the lower part of the dog's body outside the circle. On a scrap piece of Whisper White card I stamped the wine glass with Smoky Slate ink and the plate of biscuits with Basic Black ink, watercoloured them, fussy cut and glued them to the table top. 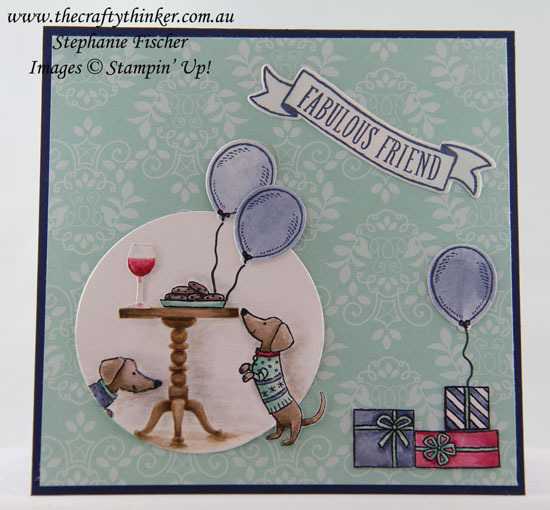 The presents were also stamped on a scrap piece of Whisper White with Basic Black ink and coloured before fussy cutting them and gluing them to the card front. 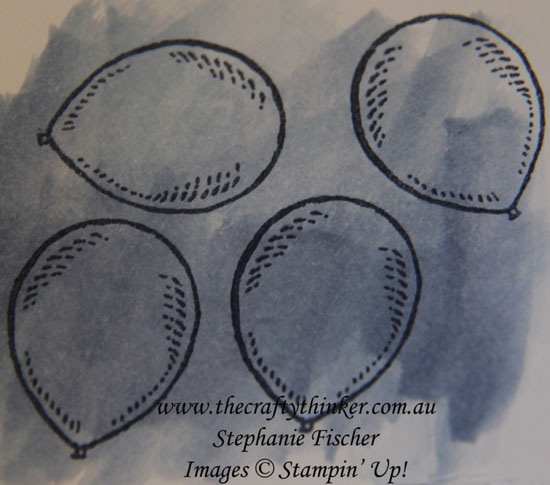 For the balloons, I used some Night of Navy ink to apply a light watercolour wash to a scrap piece of Whisper White card. 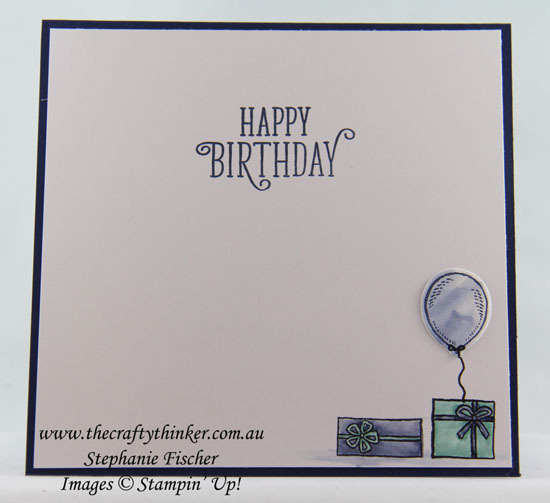 When it was dry, I stamped the balloons with Night of Navy ink and then cut them with the coordinating die before adhering them to the card front and hand drawing the strings and bows with a Basic Black Stampin' Write marker. Naturally the inside of the card had to be decorated to match! The presents are stamped and coloured directly onto the card but the balloon was made separately and glued in.